How does bleaching hair or decolorizing hair work? Q: How does bleaching hair work? A: Hair bleaching (also called decolorizing) works similarly to regular haircolor in that it uses a 'developer' or 'activator' (usually hydrogen peroxide) to soften and raise the cuticle of the hair. However, the similarities end there. 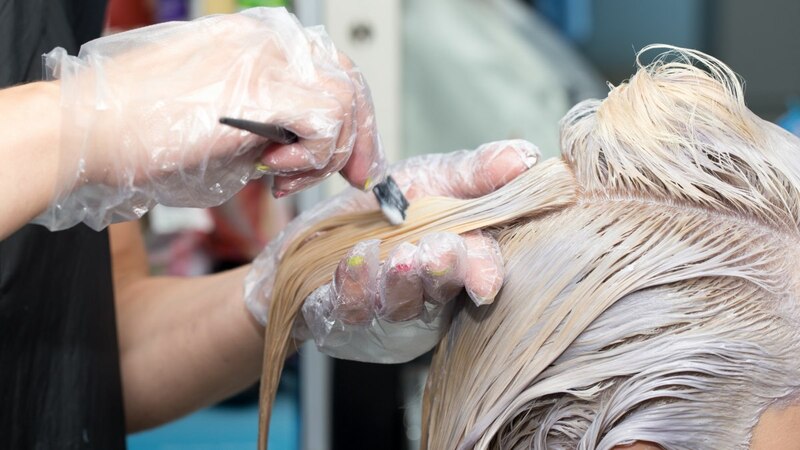 Instead of depositing a color into the hair shaft, the bleaching agent penetrates the shaft and disperses the color molecules that are already there. The more color molecules that are dispersed, the lighter the hair becomes. Bleaching is especially useful when you want to go from a darker hair color to a much lighter one. Most haircolor can be mixed with higher volume peroxides to provide greater 'lift' of the color, but in order to reach the lightest shades of haircolor, you usually need to pre-lighten the hair with a bleaching agent first. It's important to note that bleaching the hair is a very harsh process, and can have devastating results if you aren't careful. I've said it before, but it bears repeating: Normal haircolor formulas will go inert after 30 minutes, so it's nearly impossible to "over-process" them. However, hair bleach will remain active as long as it has moisture and the longer it processes, the more damaged the hair will become. Likewise, the lighter you take the hair from its natural color, the more damage will occur, so always use extreme caution when using hair bleach. How can I remove bleach from my hair?